You are here: Home / Add-ons / Will Disabled Add-ons Slow Down XenForo? Should One Uninstall Disabled Add-ons? Many XenForo webmaster install add-ons for testing purpose but often leave them as disabled without deleting them. Will such add-ons slow down XenForo? 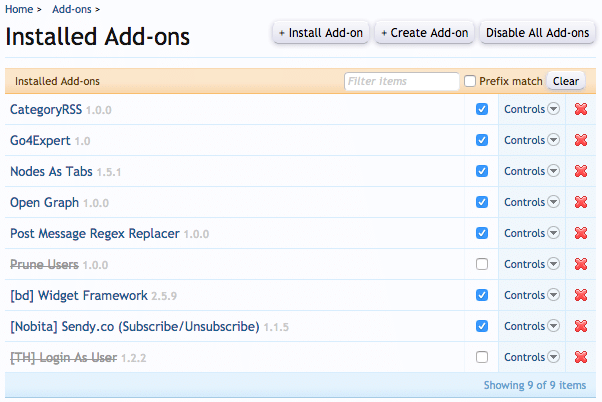 What is Disabled Add-ons in XenForo? Installed and inactive or disabled. 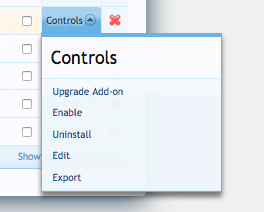 Any addon installed is automatically activated by XenForo but one can disable them by unchecking the checkbox or from the disable option under the controls drop down menu. Disabled option under the menu is preferred way to disable an addon. You can see all the installed add-ons both active (as blue links) and disabled (as gray stricken out links) on the installed add-on page (Under Home > Add-ons) in the XenForo admin area. Do Disabled add-ons Slowdown XenForo? NO. XenForo only loads active add-ons event listeners which means, on each page on the front end, it only loads models, view and controllers of the active add-ons that are necessary for that page rendering and disabled add-ons are totally ignored. The only caveat is, a badly written add-on can invoke the model of a disabled add-on and XenForo doesn’t check if it is loading the model of a disabled add-on or not. Should I Delete disabled add-ons of XenForo? On a live forum, if you do not plan to use an add-on anytime soon, you should uninstall the addon as well as delete the associated files. You can always install the add-on later when needed. The only reason to keep the add-on as disabled is if you don’t want to delete its settings when you want to re-use the addon, otherwise, there is no reason to have add-ons as disabled.